Lacquer Lockdown: Swatched: Stardust Polish Lavender Dream, SuperNova, and Sweet Pea Review! 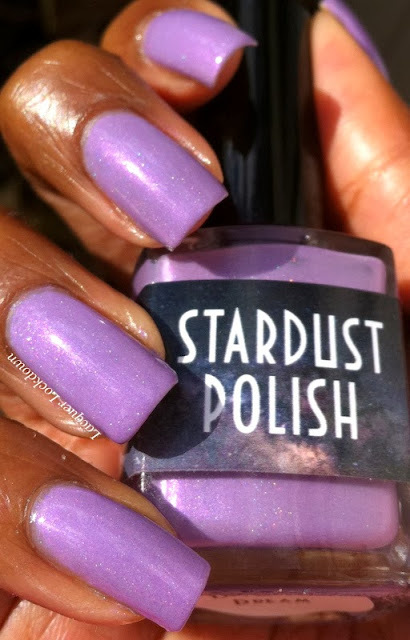 Swatched: Stardust Polish Lavender Dream, SuperNova, and Sweet Pea Review! I have some very pretty polish for you all today. I don't know who is whispering in the ears of these creative geniuses but thank you! 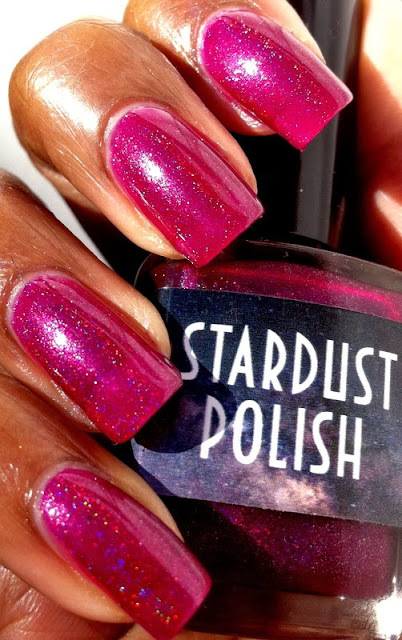 I got the opportunity to swatch a few polishes for the indie brand Stardust Polish, and I am beyond honored. If you've never heard of the brand is it run by the highly professional and sweet Drema. When she sent me the package it contained a card and the polishes laid out professionally. This is clearly someone who values the impact of presentation. I do as well that's why I can appreciate it when I see it done well! 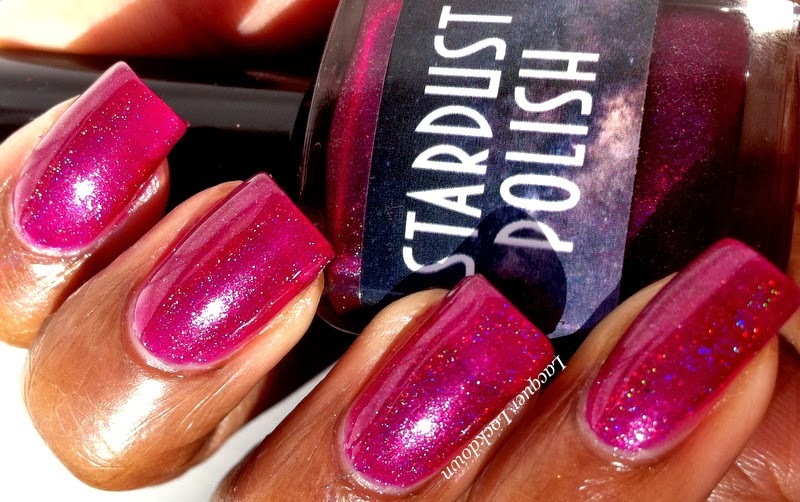 I know this brand for a red holo by the name of Yes Your Majesty inspired by the Queen of Hearts from Alice in Wonderland. For some reason I can't get the timing of this one so I have yet to attain it as it's quite popular so it sells out pretty quickly. So now that I've told you a little about the brand let's get swatching! A lavender weak scattered holo with a blue shimmer throughout. It's very difficult to capture the holo component indoors but easier to see in flashes of direct sunlight. The formula on this one is one of my favorite kind a medium thin consistency. It applied a little streaky in the first coat but leveled out evenly by the second. I used 3 coats for opacity here but could have gotten away with 2 coats easily. 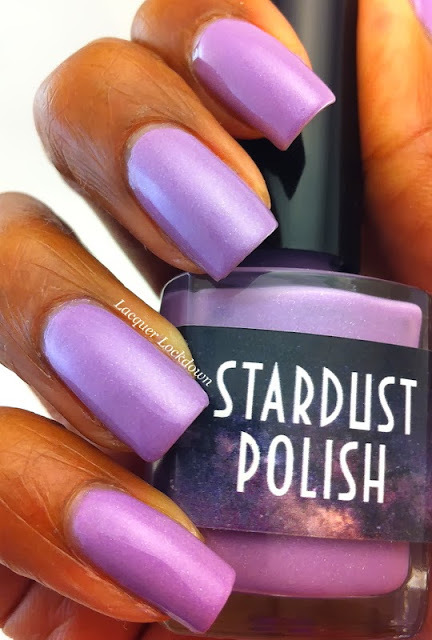 I will say this is a color that plays very well with my skintone and I don't believe I have a lavender polish with a shimmer like this in my collection. I will say though that the holographic component is very subtle even in direct sunlight, and takes a backseat to the shimmer which in my opinion isn't a bad thing when the shimmer is so gorgeous! I thought of at least 5 ways to wear this polish after I got it laid down on my nails and when that happens I know I've got a hold of something good! Easily my favorite of the bunch and not just because of my problematic holo hussy ways. Sweet Pea, a deep rich raspberry toned polish with a linear holographic finish, has utterly stolen my heart! It's so flattering on my skintone I never want to take it off. While I was going about my business at home occasionally I'd get a glimpse of fire flash from this mani and immediately stop to stare and angle my hands to catch the best light. Yup it's a winner! 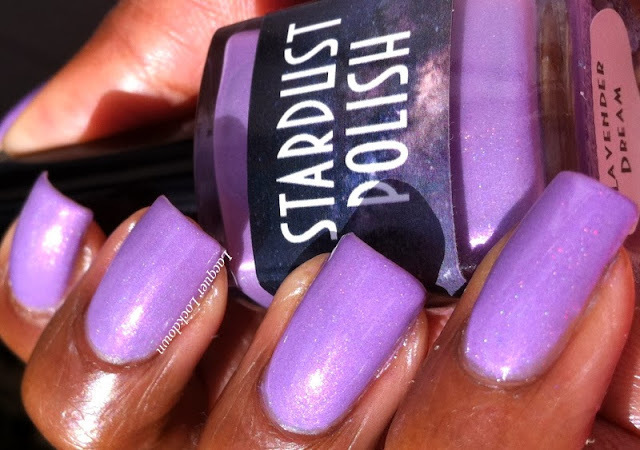 This polish is extremely thin which means you have to build it up. At three coats I still had visible nail line, but at 4 everything was perfect with no drag in between coats. Here's another bonus of this shade - I felt with every coat the berry colored became richer and deeper. I was worried about putting down so many coats to reach opacity because I felt it might take forever to dry, but as with every well done holo I've encountered this was dry at a speed that made me blink! Sweet Baby J this polish is gorgeous! Be. Still. My. Heart. 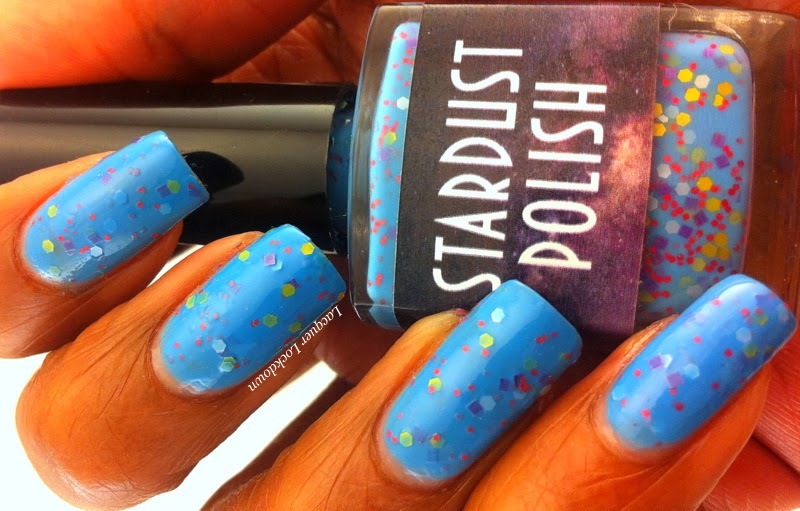 This polish is genius! I wanted to swatch it first the minute I opened the package. I went ooooohhhh and ahhhhh and squeeeee. Hey don't judge a lady has to have her little pleasures in life you know! You all know I love me some blue polish, but what I like the most about this one are the pops of reddish pink, white, and yellow in the canary blue base. This is a bold and happy polish and with the winter plaguing me by the day I could use a little burst of cheer. This polish is a also on the thin side in the most perfect way! I'm really surprised because usually cream based glitter filled polishes tend to be a bit thicker, You do however need to be careful of drag from the matte glitter and not rush between coats. Supernova is pictured here in 2 self-leveling coats. I had to adjust the color here so my skin looks jaundiced but this blue is what it's like in real life. Fantastic!!! So thoughts? These polishes are all unique and pretty in different ways and I like that! I think Drema did a good job of showing me and and as such you what her brand is all about, namely presentation and eye-catching elements in the vein of shimmer, holo, and bold glitters. I can honestly say it's been a while since I have been sent polishes to review and found I loved each one equally in different ways! That said because I liked them all so much I took the time to create nail art for all three polishes! So come back tomorrow and check out my Startdust Polish nail art. I want to say thanks for reading and I'll see you next post! Clearly as I already stated these polishes were sent to me for review but like everything else on this blog I give you my true opinion 110% of the time!